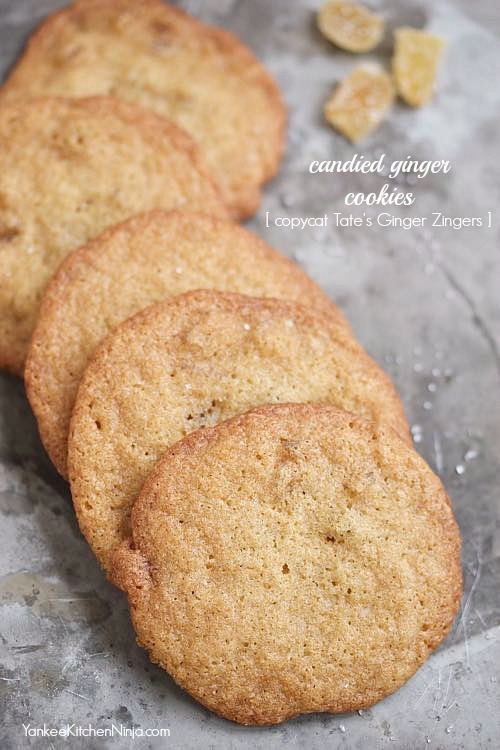 Thin and buttery cookies, with crispy edges, chewy centers and a zing of crystallized ginger: a copycat recipe for Tate's Ginger Zingers. Oh, hi. Sorry it's been awhile. Life has been taking precedence over blogging for a wee bit -- hope you understand. But I couldn't let the holiday season slip past without sharing my latest favorite cookie recipe with you. Last summer, I spent some time at the beach in North Carolina with my oldest friend and some of her other friends (as it goes, now we're ALL friends -- yay us!). We all shared meal preparation and each brought some of our favorite goodies from home to share with the group. My friend mentioned that she'd brought these amazeballs ginger cookies that I needed try. ZOMG, peeps, she was not kidding. They were Tate's Bake Shop's Gluten Free Ginger Zinger Cookies. None of us there who were scarfing them down eats gluten-free, but it totally doesn't matter. 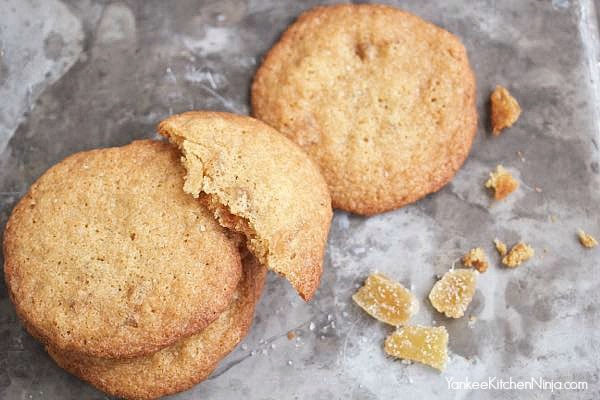 If you are even the teeniest bit a fan of crystallized ginger, you will go cray cray for these cookies -- thin and buttery, with crispy edges, slightly chewy centers and a zesty zing of crystallized ginger in almost every bite. I knew immediately that I had to figure out how to make them myself -- you know, like a good ninja does. From the first nanosecond I got home from that beach trip, I've been trying to perfect a copycat recipe for Tate's Ginger Zingers. And I've finally done it. And they don't even have to be gluten-free like Tate's, unless you want them to be. 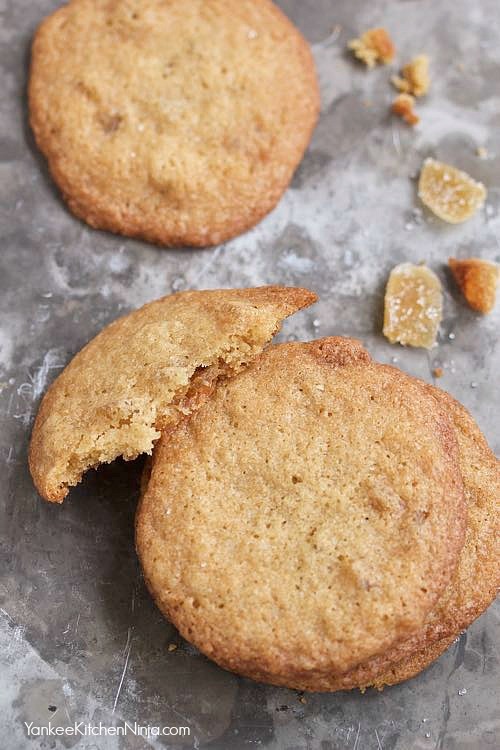 For my version of this candied ginger cookie, I toned down the butter and sugars a bit (trust me, your tastebuds won't miss 'em and your body will thank you) and chopped my crystallized ginger a bit finer than what's in the original Ginger Zinger cookies -- that's just how I prefer it. If you're a gingeraholic, go ahead and make 'em chunky, you little monkey. 1) After dropping the dough onto a parchment-lined baking sheet, use your fingers to gently and slightly tamp the cookies down, just so they don't have a peak. Now, don't squash 'em down super flat! With a little tamping, the centers cook a bit more evenly and maintain that signature chewiness. 2) Watch the time and cookie color like a hawk. Your oven no doubt cooks differently than mine which cooks differently than my Aunt Tilly's , etc. etc. The time is a guideline -- the more important part is to remove the cookies when the edges AND the centers are golden brown. Too soon and the centers will be gooey, too long and the edges will taste overdone. Don't worry, you'll figure it out. Trust me, you'll be happy to keep baking batch after batch after batch and "taste-testing" until you get it just right. Winky wink. Given that it's December, go ahead and prioritize these on your holiday cookie baking to-do list. You will absolutely rule that cookie exchange, I guarantee it. Are you a fan of Tate's Ginger Zingers? Leave a comment: The Ninj wants to know. To make these ginger cookies gluten-free, just like Tate's, simply substitute GF flour. In a medium bowl, whisk together the flour, baking soda and salt, then set aside. In the bowl of a stand mixer, cream together the butter and both kinds of sugar on medium speed. Add the water, vanilla and eggs and mix until combined. On low speed, mix in the flour mixture then fold in the ginger (be sure NOT to over-mix the dough). Drop the dough in 1-tablespoon mounds onto a parchment-lined baking sheet, leaving about 2 inches between (they spread quite a bit). Pat them just a little bit with your fingers to *slightly* flatten them (don't mash them flat). Bake 11-12 minutes or until the edges as well as the centers are golden brown. Remove from the oven and let the cookies cool on the sheet for 1-2 minutes, then transfer to a wire rack to cool completely. Makes about 3 1/2 dozen 3-inch cookies.